Recently Ortwin worked on something which requires skill and precision. 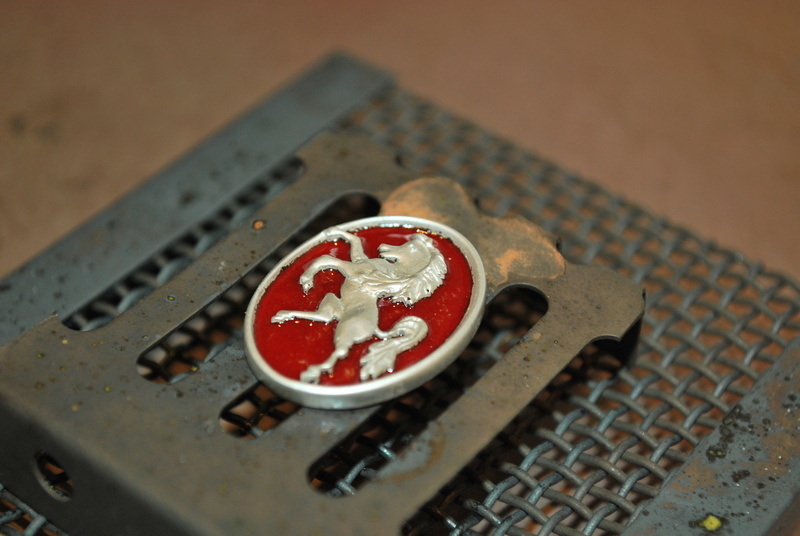 One of our customers asked us to create an Invicta Horse badge, and the key element to it was a red background. It was clear that to achieve this background, Ortwin would need to incorporate vitreous enamelling into the piece. In simple terms, enamel, in it’s raw form, is finely ground glass – a powder. It gets sifted over metal and fired in a kiln at around 800 degrees. The powdered glass fuses to the metal and creates a glassy, smooth and vibrantly coloured surface. 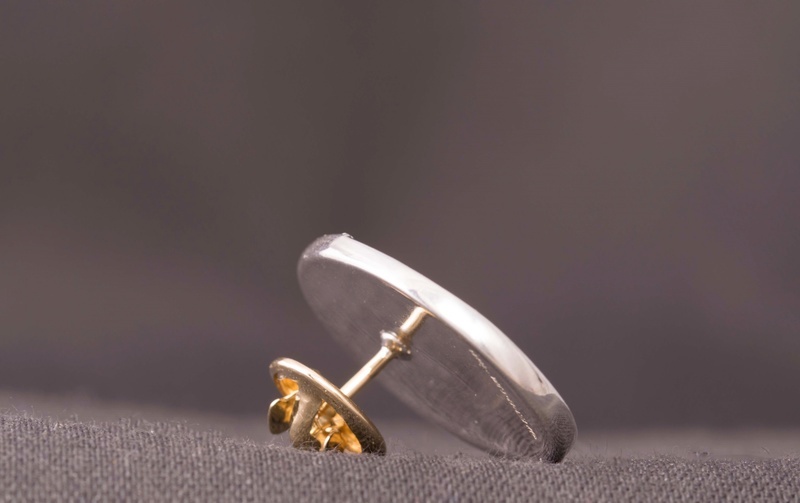 It is a technique used to bring colour to jewellery. 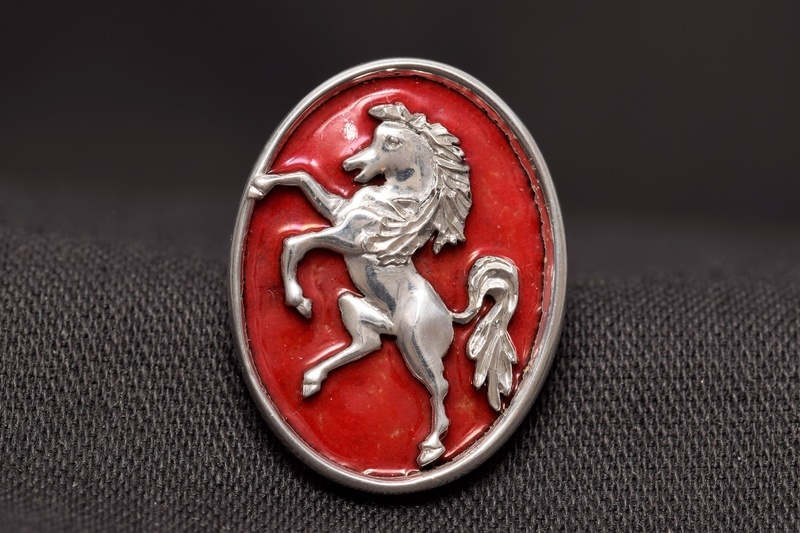 Anyone who has touched on enamelling in school or as a hobby will know that red is a difficult colour to get right, and on silver even more so. Ortwin has had practice before and this time it worked perfectly, on the first try. 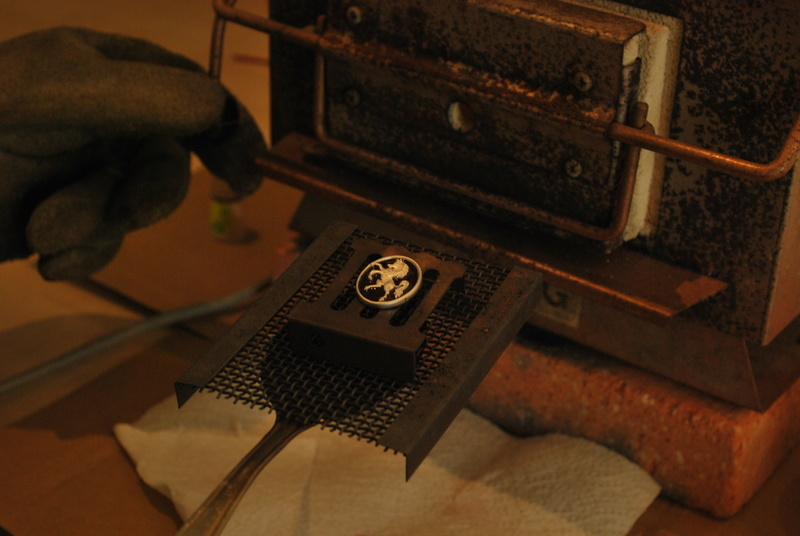 After the silver part of the badge was formed, Ortwin moved on to the enamelling. He started by separating the red enamel from the silver by layering of clear enamel first, which was fired on into the recess. 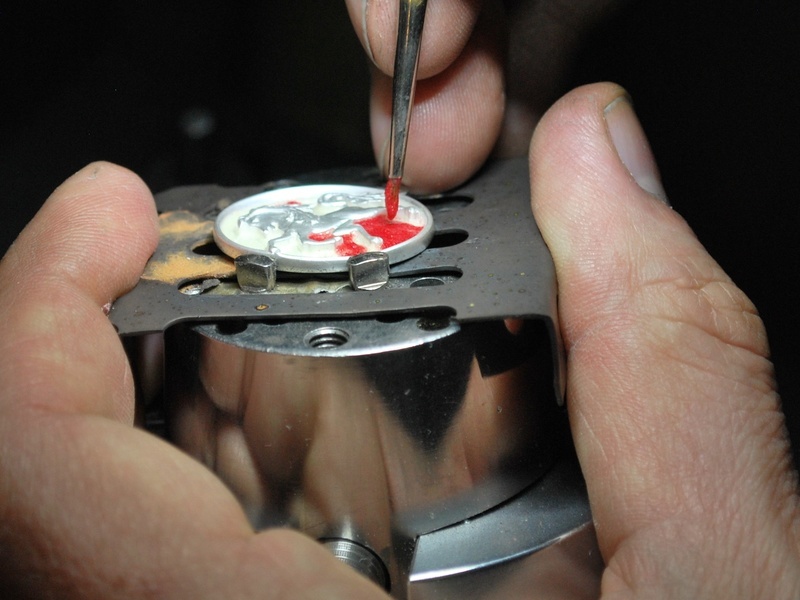 When the red enamel is later added, it doesn’t touch the silver because of the clear layer which allows for it not to turn brown. 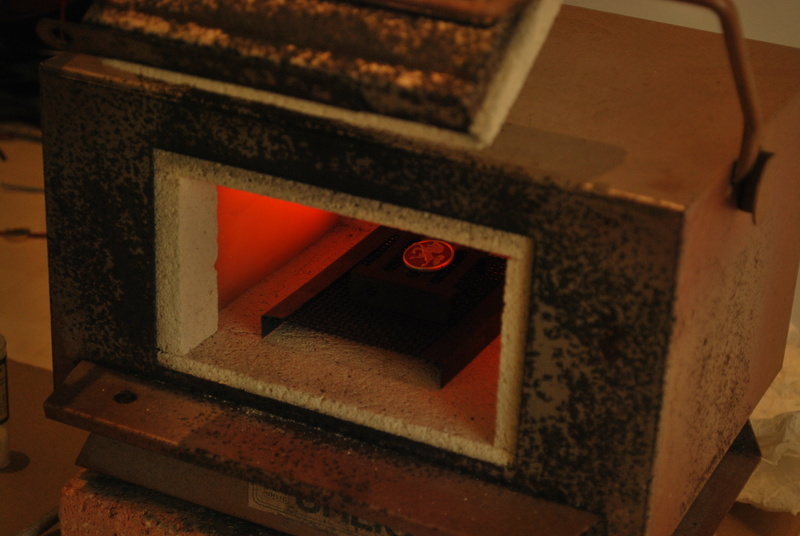 The trick is to get the temperature just right in the little kiln so the red enamel is not overheated and mixes with the clear. 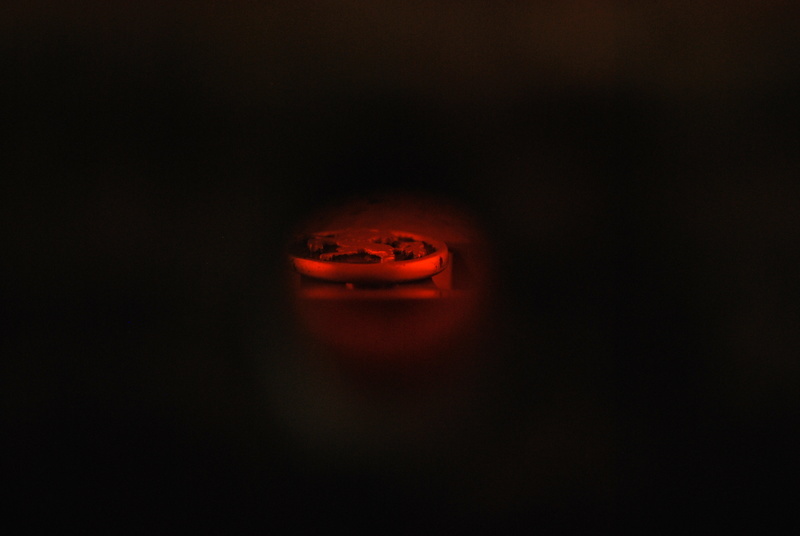 This picture shows the view through the inspection hole of the kiln. With a bit of luck, experience, nerve and a well-timed prayer is required to hit the precise moment when the enamel has to come out of the kiln. What follows is an exciting wait while the hot black looking glass cools down to reveal its true red colour. Apart from the red colour, this is reasonably basic enamel which work we can carry out here in our workshop. 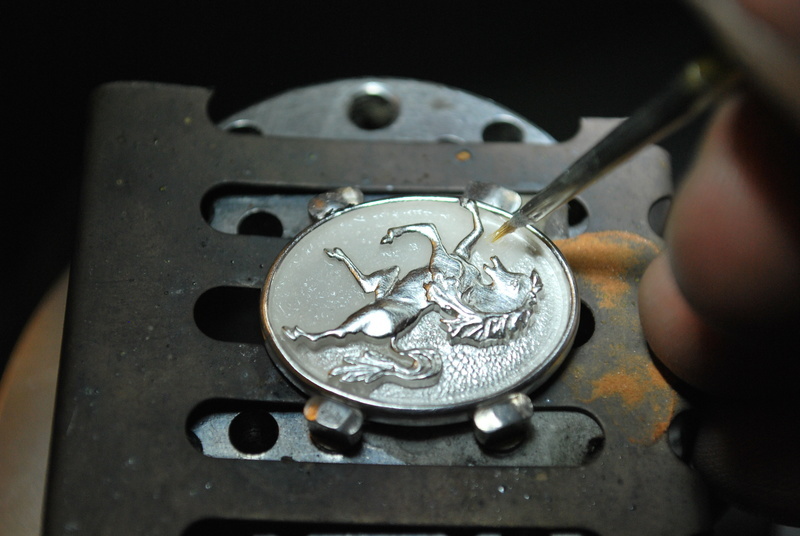 The true advanced art of the Enameller is much specialised and we have great respect for it. But for us it is fun to do it ….once a year.